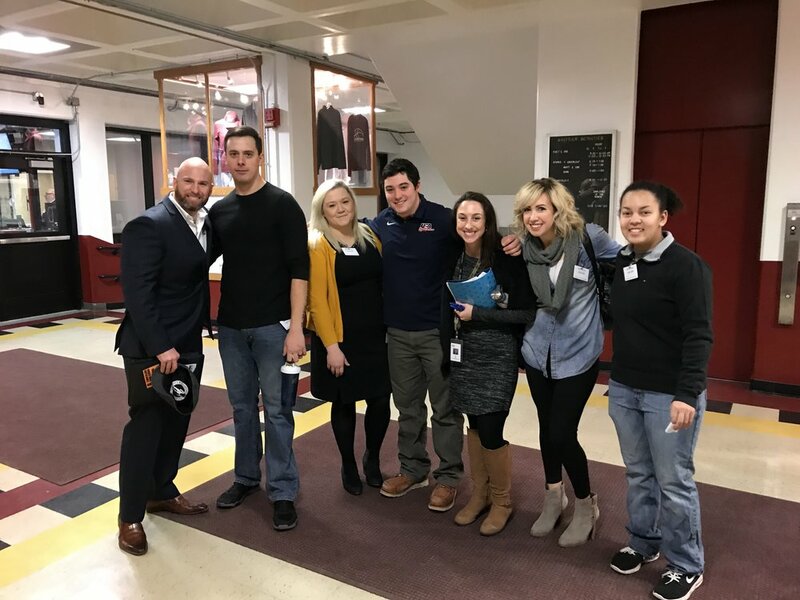 Six alumni visited their alma mater to speak to freshmen as the 9th graders conclude their exploratory program and begin their chosen area of technical study. The annual alumni presentation is intended to guide freshmen through their four years at Whittier by recognizing their potential in and out of school. Speakers are chosen from a variety of shops, with a special focus on alumni who chose a non-traditional route for their gender. "All the graduates have one thing in common; they started here and were once freshmen in the same position as our students today," said Tia Roy, Whittier’s Community Services and Post-Secondary Early College Adviser, who organized the program and is an alumnus herself. "We want freshmen to see all the possibilities that are out there following graduation, whether it's college or a career." The entire freshmen class attended one of two presentations with alumni, with Tia Roy facilitating the conversation with a series of questions. Why did you choose your shop and are you happy that you made that choice? Roy: I chose graphic design, cosmetology and culinary, they were my top three. I graduated 16 years ago and I've done all three of those. I went to college for graphic design. Then I was like I really want to try cosmetology school. I did that, I still do that. Now I own my own shop and we do smoothies and sandwiches. I get to do the social media through what I learned in graphics. I'm so happy I got to come to Whittier and experience what I did. Kuver: I picked auto technology because all my friends did. My sophomore year I made probably the biggest decision of my life and changed my major to CAD (Computer Aided Drafting) even though none of my friends were in it. That’s something I really want you guys to think about. Be a leader not a follower. You may have picked a shop now and by the end of the year you might not like it – you can still change. Don’t settle. If you feel like this isn’t for me, change. Dennis: Thirty years from now, there's a significant chance you're going to be doing what you're doing in this shop. Think about that. What advice would you give first-year students to be successful? Albrecht: Life is too short to be in a shop or major that you don't enjoy. Always have a backup plan and have a backup plan for your backup plan. Hobbs: I was in a non-traditional shop. I had to make sure I understood everything completely so I could get the better co-op jobs that guys were offered just for being men. Toward the end of senior year, I got the Tradesman of the Year and Local 103 scholarships, which allowed me to purchase all my tools and my shop teacher talked to my co-op boss and I got into the union. Students also had the opportunity to ask panelists some of their own questions. What was the best decision you made while at Whittier? Hobbs: Get involved with extracurricular activities. Whatever it is, get into it and have fun with it. Kuver: Retain the knowledge that you learn here. That's the best thing you can do. If you're going to be a plumber and you don't know how to fit a pope and your boss tell you to fit a pipe, you're going to get fired. Megan, you were in a non-traditional shop (plumbing) for a female, how was that experience? Albrecht: It was difficult sometimes, but I was with a good group of kids. We all had fun. I don't regret it at all.